If you are looking for a great, easy, and fast way to make delicious and healthy meals, a pressure cooker is a must! Whether you’re seeking to feed the masses or make a quality private meal, this guide will walk you through everything you need to know in selecting the best pressure cooker to meet your needs. Take a look at our pressure cooker reviews below to help you find the best brand and model suited for your kitchen. There are basically two types of pressure cookers commonly available today: electric pressure cookers and stove-top pressure cookers. The electric pressure cookers provide lots of options and simplicity of use while the stove-top models are sturdy, reliable, and provide the advanced user with some additional options. There may be a place for both in your kitchen depending on the applications that you find engaging in the most. –> The following products are all solid choices. We’ve based these reviews on careful research, product comparisons, and user reviews, all to provide a comprehensive guide for buying a model that fits you best. The pressure cookers on this list have all met or surpassed the standards of a user-friendly, durable, safe, multifunctional, energy-saving, and environmentally friendly product expected in quality pressure cookers. The first models are electric pressure cookers while the ones at the end of the list represent some solid stove-top models. 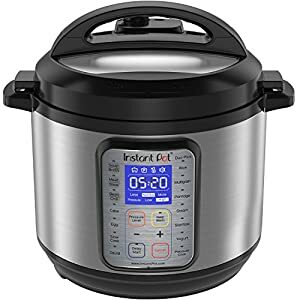 If you are looking for the best electric pressure cooker, Instant Pot IP-DUO Plus 60 9-in-1 Programmable Pressure Cooker is our TOP PICK in terms of features, price, and quality. 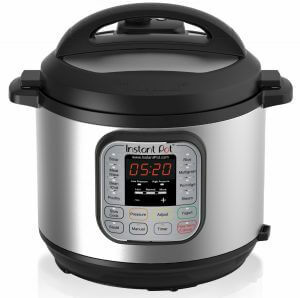 The Instant Pot IP-DUO Plus60 9-in-1 is the newest addition in the Duo series, and one of the best-selling cookers in the pressure cooker industry. 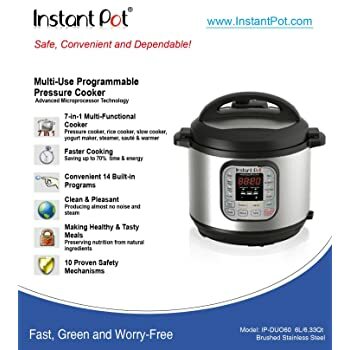 This new instant pot comes with advanced microprocessor technology that incorporates all of the great features that previously made the Duo one of the best sellers in the market, and has now been fitted with new and improved features that support the latest health-conscious lifestyle. If you are one of those people who would like everything to work with just a press of a button, a fully programmable pressure cooker like this one from the Duo series is a go-to. This pot is designed to cook foods up to 2-6 times faster, and is known to save up to 70% energy. A complete array of functions with the 9-in-1 Multi-Functional Cooker – allows you to cook any dish with ease –i.e., meat, chicken, potatoes, yams, fish, vegetables, pork, soup, stew, desserts, beans, grains, and many other products. Easy to use control panel with 14 built-in Smart Programs. UL and ULC certified with 10 proven safety mechanisms…… and MUCH MORE. Unlike its predecessors, the Duo Plus 9-in-1 features three new programs including Cake, Egg, and Sterilize. As their names suggest, the Cake program has been designed to cook moist and soft cakes, whereas the Egg program ideally helps you prepare eggs in just minutes. The Sterilize program is meant to help you pasteurize milk, sterilize jars, baby bottles, and utensils. 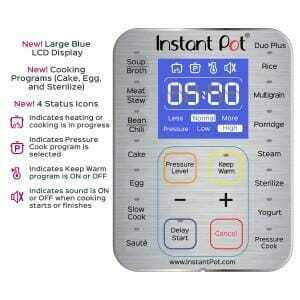 All these features are packed in the Instant Pot IP-DUO Plus60 9-in-1 to give you a complete instant pot. The Mealthy MultiPot 9-in-1 is one of the best electric pressure cookers in its price range. 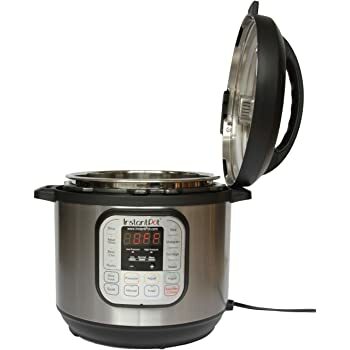 With this pressure cooker, you can perform various tasks including making cakes, slow cooking, steaming, cooking rice, warming pre-cooked meals, making yogurt, pasteurizing, and sautéing. You get a stainless steel steamer basket to help you separate dishes that you are cooking simultaneously as well as a 6-quart stainless steel pot, which is ideal for a medium family. This model is easy to use thanks to the 14 easy-touch programs that help you cook a variety of meals for your family. Among the best features of this program is its mobile app. 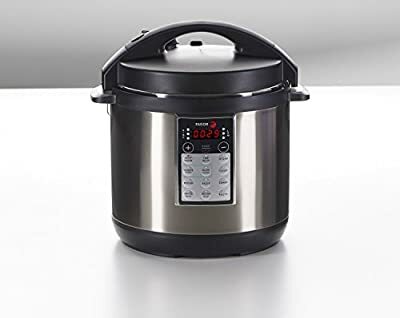 After purchasing this electric pressure cooker, you are requested to register it by signing up with the Mealthy website. You will be allowed to download the Mealthy mobile app that has a large list of easy-to-cook recipes crafted for this appliance. There are also step-by-step videos to show how these recipes are prepared. In addition to this, you will also receive a 1-year warranty on your appliance after signing up. This pressure cooker comes with a lot of extra accessories including silicone mitts, an extra silicone gasket, steamer basket, steam rack, a ladle, a rice paddle, and a measuring cup. However, there are some complaints that this product scratches easily. 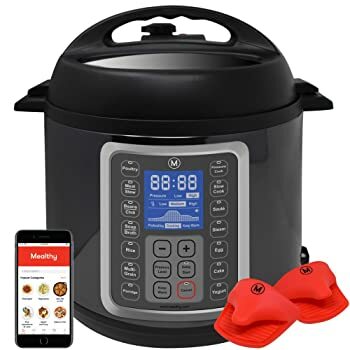 Overall, it is one of the best electric pressure cookers on the market thanks to its many unique features including a mobile app and quick-start guide as well as many bonuses such as steamer basket, rice paddle, and extra gasket. From the same makers of our #1 listing, but at a better price, the Instant Pot DUO60 is a great option when it comes to selecting a quality pressure cooker. The lower price comes at the sacrifice of some of the newer clicks and whistles of the previously mentioned product. However, this pressure cooker is still of great value! Made of stainless steel, the Instant Pot DUO60 provides you with a quick and easy way to cook healthy meals. Simply load the ingredients in the pot, cover it, and begin cooking. 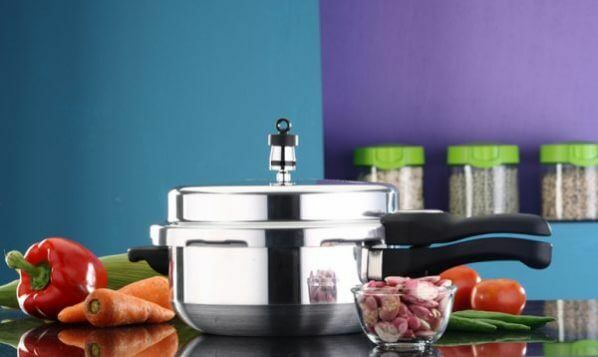 The Pot DUO60 cooks via high pressure and reduces the traditional cooking time by up to 70% without sacrificing important water-soluble vitamins and minerals in the process. Regarding safety, the product has passed the strict UL and ULC certification that seeks to ensure user peace of mind when cooking with equipment like a pressure cooker. The removable, non-stick, stainless steel pot, sealing ring, and anti-block shield are all dishwasher safe, as are the accompanying rack, rice paddle, soup spoon, and measuring cup. Not to mention, all of this comes with a handy recipe book to have you cooking in no time. The Instant Pot cooker is designed to do it all. All of its great features and sleek look combine to make it not just a pressure cooker, but a rice cooker, slow cooker, steamer, and warmer capable of sautéing and browning as well. Garnering an almost perfect rating from more than 9500+ consumers, we feel very comfortable in recommending this product to anyone looking for the best pressure cooker out there. Built to last, this pressure cooker has replaced many outdated models due to its improved efficiency, engineered design, and performance. This 1000 watt pressure cooker is protected by its manufacturer’s 1-year warranty. You will never have to worry about the quality or performance of this device. 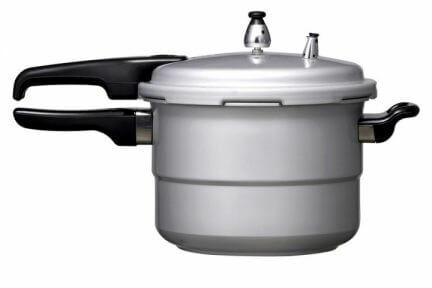 As Seen on TV PPC Power Pressure Cooker is a perfect device for those who want to cook your favorite dishes easily. Complete with an extra-large size, multiple functions, and of course, 70% faster cooking compared with traditional cookware. This pressure cooker allows you to daily cook delicious and healthy meals without sacrificing your precious time. Its flavor infusion technology is a special feature seldom found apart from this pressure cooker designed to maintain all the aroma, taste, and flavors of your dishes. Not only will the taste of food cooked in this pressure cooker leave you impressed, but the aroma it fills your house with is definitely an added bonus. PPC Power Pressure Cooker has enough capacity to hold 4pt jars, making it ideal for canning vegetables, fruits, and other eatables. The automatic Keep Warm mode preserves your food for a long time, and its stainless steel coating ensures that the heat never escapes from the food. It is very easy to care for and maintain the condition of this pressure cooker- simply wipe the stainless steel housing and watch it clean with ease. All of these great features prices this sturdy, high-end pressure cooker at a mere $80! Like other multi-cookers, the Fagor 670041880 LUX Multi Cooker can reduce your cooking time by up to 70% as compared to conventional cooking processes. This cooker allows some flexibility in its cooking process due to its selection of either high or low pressure depending on the recipe and quantity of foods you want to cook. In addition to the pressure setting, it also includes numerous different cooking modes to tackle the task at hand: Slow cooking, Rice cooking, Pressure cooking (high or low), Yogurt, Steaming, Simmer, Browning, Warming. Cooking delay of up to 6 hours. Included recipe booklet and an e-recipe book (more than 75 recipes). While there are many competitive products in the market, the Fagor America comes with a reputation for pristine products you won’t find with all other brands. This model is no exception and competes well with the other top brands. 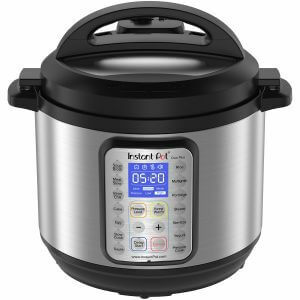 The Instant Pot Ultra 6 Qt 10-In-1 Pressure Cooker is a great pick for those after the latest and greatest features from the leading manufacturer of pressure cookers This model offers all of the top features of our #1 pick plus more, all for a reasonable price when you take into account the array of features you’re getting! 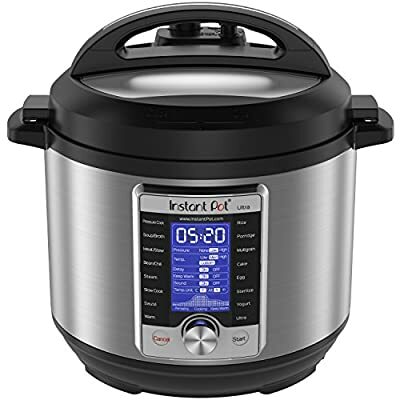 The Instant Pot LUX60 V3 6-in-1 is the budget model from Instant Pot that gives you great performance for a very manageable price – while not compromising efficiency and effectiveness. The Instant Pot Lux V3 adds a few new features to the offering that include a cake program, egg program, and the 3rd generation microprocessor which among other things provides some additional cooking time options. If you compare the Instant Pot names, DUO60 and LUX60, you already might have been inclined to think that there is not much difference between the two devices. In fact, they are quite similar in terms of the design, controls, features, and cooking capacity. In light of all the similarities, there is one small minor difference which causes the price difference: The display of the DUO60 is increased by 30% compared with LUX60, particularly in terms of function (Using 14 built-in smart programs compared with 10 of LUX60), the pressure sensor is improved (DUO60 doubled compared to LUX60), and the DUO features some newer safety features. Much of what makes the LUX60 the best pressure cooker can also be attributed to the DUO60 as well. However, if the DUO60 or DUOPlus 60 is too expensive for your budget, then the LUX60 is a perfect alternative. It is powerful, multifunctional (6-in-1 Multi-Functional Cooker with 10 built-in smart programs) and comes at a very reasonable price. 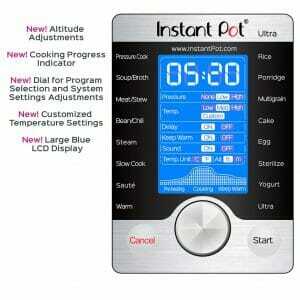 If you’re looking to money, look no further than purchasing the Instant Pot IP-LUX60. If you’re searching for a cost-effective, spacious, yet capable pressure cooker, then the Presto 01370 8-Quart Stainless Steel Pressure Cooker may be a good fit for you. The Presto 01370 is a great choice for cooking healthy and delicious food at a notably quicker pace than conventional methods. It’ll help you save time, energy, and cost due to its 3 times faster cooking process. The Presto 01370 Stainless Steel Pressure offers a quick pressure and steam release system allowing you to cook vegetables and white meat to perfection within minutes. This quick cooking is possible due to its stainless steel construction and a special tri-clad base. Does the high-pressure steam have you worried? Its quick release valve safely decompresses the cooker and quickly cools your meal! The 8-Quart capacity can hold up to 7.6 liters of liquid, and the pressure regulator backed by a cover lock indicator automatically maintains appropriate cooking pressure throughout the process to deliver a tender and delicious meal. The cooker allows you to cook more than one food at once thanks to its steaming basket that effectively separates the food without any intermingling of flavors. In addition to this multi-function cookware, you’ll also receive a complete guide and a recipe book as well! Research shows the Presto Pressure Cooker to be one of the most popular, yet reasonably and competitively priced pressure cookers on the market. There are currently over 2900 reviews on this cooker, and one reoccurring theme was just how surprised users were by the affordability of the Presto Pressure Cooker. The safety features of this model make it easy for even a novice cooker to use. Additionally, the pot is non-stick, which makes clean up just as easy as preparation. Simply toss the pot into the dishwasher, and that’s all she wrote, or should you go the handwashing route, you’ll find that to be a breeze as well. The heating control keeps the temperature regulated and heat constant, meaning no fluctuations like you’d experience with stove top pressure cookers. The cover lock indicator of Presto 01362 tells you when the pressure reaches its peak. At the same time, it tightens the cover at high internal pressure and loosens it as soon as the pressure is reduced. The automatic pressure regulation makes the Presto 01362 Stainless Steel Pressure Cooker ideal for smooth-top, regular, and induction range cooking. The pressure cooker comes with a 64-page manual and recipe book. A special rack is also included in the package, allowing you to cook several different foods separately in one go. For about $40, you’ll find no better alternative than Presto 01263 6-Quart Pressure Cooker. It is indeed the best pressure cooker for the price. The recommendations above should help you find the best electric pressure cooker for your needs. If you would like to see some additional options by clicking here, or for more general information about selecting the best pressure cooker and about pressure cooking in general see the sections that follow. With a pressure cooker, your meal cooking time is cut in half so that you can enjoy eating your dishes sooner and additionally spend less time on cooking and cleaning. A pressure cooker not only cooks your food fast but it also preserves more nutrients and vitamins in your food that are typically lost in alternative cooking methods. The magic and effectiveness of pressure cookers revolve around the simple concept that, under pressure, the boiling point of any given liquid is always higher. Once the pot is sealed, the pressure in the device begins to increase. The pressure inside elevates the boiling point of water from 211 degrees to 250 degrees. The increase of pressure creates steam and consequently, the hot steam heats the food in the pressure cooker, thus rendering a quicker and far more efficient cooking process. In addition to this, pressure cookers tend to consume less energy than traditional methods as well. Below is a list of further benefits you can get when opting to use a pressure cooker. Save Time: With a regular stove, you can cook a couple of pounds of beef by boiling it for about 3-4 hours in addition to occasional stirring. If you utilized one of the best pressure cookers, that time is reduced by around 70%, which means you save 2-3 hours! Imagine what you could do with an extra 2-3 hours! You could spend time with your family, prepare other dishes, or just relax while you’re waiting for your guests to arrive! Save Money: Because pressure cooker can cook in far less time, you save tons on electricity and energy bills. Your Safety: Modern pressure cookers are now quite safe to use. They are designed to allow excess pressure (if there is any) to vent out at any time. They have stay cool handles, and some of the models will automatically switch to the warm setting when your meal is complete, so it will stay warm until you are ready to serve while not retaining excess heat. 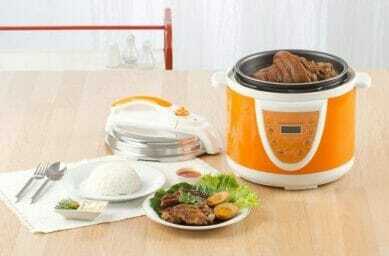 Flavor of food: A pressure cooker helps you retain the nutritional value of food. In terms of the physical appeal of the meal, the food maintains its texture and color, meats retain flavor, and all other ingredients cook to their ideal consistency. Saves Space: Multifunction pressure cookers today double as rice cookers and slow cookers, meaning you can even cut down on your appliance count and save valuable cupboard space. (Find the best rice cooker and best slow cooker for the money right now!). In addition to just seeing the overall benefits of having a pressure cooker in your home, you then have to decide which type to opt for. To help you decide, we’ve compiled a detailed comparison of the stovetop pressure cookers and the electric pressure cookers. In deciding which one is more suitable for your home, this guide will pinpoint the exact features you want your pressure cooker to have. 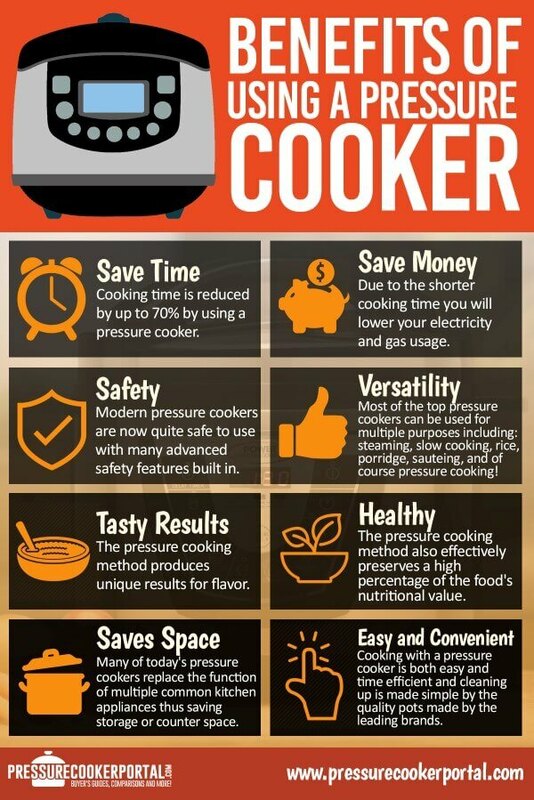 With this chart, you can also see the advantages and disadvantages of the two types of pressure cookers. There are two types of pressure cookers: second generation and the electric pressure cookers. There are still some variations of first generation, or “old style” pressure cookers on the market today, but they’ve generally fallen out of popularity since they usually only had one pressure setting, heavy. The more popular models of pressure cookers today are the second generation and the electric pressure cooker models. Other than their extensive safety features, these models have also added the advantage of having more than two pressure settings. 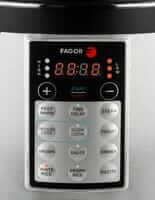 This allows you to modify the pressure within the cooker to control how your food will be cooked. This feature combined with the pan heating element produces a lot of flexibility in how exactly your prepare your food. How Do I Choose Between an Electric and a Stovetop Pressure Cooker? Before the invention of the electric pressure cooker, the stove top version was the only one in the market. Its design has been modified over the years to meet the needs of many different users. Many still argue that this is the best pressure cooker, but in the spirit of objectivity, here are a few pros and cons to weigh. It usually takes about 11 minutes for enough pressure to build up, which is quicker than the electric pressure cooker’s 14 minutes. You can use the cold water quick-release method to release pressure, which takes up about 30 seconds. Additionally, it can be opened using the normal release method, which takes about 2 minutes, or the natural release method, which takes about 10 minutes. Safety wise, it has a lid locking system that activates when the pot is under pressure and an additional release valve that release pressure should it build to excess. Can be used and stored like a normal cooking pot. This model usually doesn’t have integrated timer or scheduling features. Aluminum pressure cookers are not very durable, but stainless steel models are very durable. Stainless steel stove top pressure cookers are among the best-rated pressure cookers in the market today. With their practicality and versatility, you can have an almost unlimited array of dishes that can be cooked with these pressure cookers. Although lacking the self-scheduling feature, a diligent cook can still set the time manually, meaning this lack of feature can easily be minimized. With the best electric pressure cooker, you have the capability to program and adjust multiple settings depending on your needs. For the electric pressure cooker, you can change the temperature and pressure levels with a click of a button. There are also small displays that will give you the current temperature as well as pressure levels in your cooker. Electric pressure cookers are very convenient often frequented by people who rely on canned or processed foods. Although it is relatively new to the world of kitchen appliances, the electric pressure cooker is quickly making waves, in part due to its ability to have food ready in mere minutes. Here’s a quick rundown of the pros and cons of electric pressure cookers based on several electric pressure cooker reviews we’ve analyzed. Everything is controlled: Both the temperature and pressure can be controlled by electric pressure cookers. You are saved from the hassle of trying to manually control the flame as well as being limited to the pressure control capabilities of manual pressure cookers. 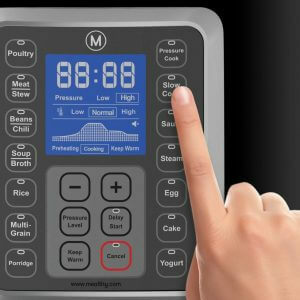 Many models have numerous pressure settings, often with preset labels to further simplify cooking. Examples of these labels are “meat”, “high pressure”, “low pressure”, and even “rice”! Heat regulation is completely automated. Just select the pressure and cooking time, and you’re ready to start cooking! These models have integrated timers to keep track of your cooking time. Gone are the days when you had to watch over your pot for fear that it might burn! Some models even allow you to delay the start of cooking for up to 11 hours! This allows you to choose your desired settings before heading out, and then your meal will already be cooked by the time you’re home! This is possibly the best electric pressure cooker feature available. The digitization of these units has allowed for more precise heat and pressure monitoring, meaning if pressure build in excess it safely diffuses the pressure to eliminate risk. In addition to this, it also features its own integrated electric coil as a heat source. It doesn’t have the cold water quick-release feature for releasing pressure in the pot. Some newer models may be used as a regular electric pot. But generally, electric pressure cookers can’t be used unless you’re pressure cooking. The electric pressure cooker is indeed a modern marvel. With so many automated functions, it may often feel like meals are cooking themselves! If you’d rather save counter or storage space to support your other pursuits like finding the best panini press, then an electric pressure cooker is the ideal choice! 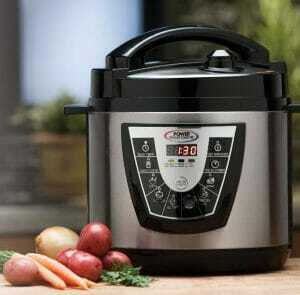 How to Choose The Best Pressure Cooker? Aluminum or Stainless Steel Pressure Cooker? Cookers made from stainless steel can better resist corrosion, scratches, and warping. That means it retains its pristine appearance and function for much longer. Stainless steel doesn’t react negatively to food products and is longer lasting. A stainless steel cooker has a stylish, sleek look and is more expensive than the ones made from aluminum. Aluminum cookers, on the other hand, are often cheaper and a better conductor of heat than stainless steel. However, aluminum is also a softer metal and thus prone to dents and scratches that could mar its looks. Furthermore, aluminum may react negatively with certain acidic foods. Basically, the choice between the two metals boils down to two important factors: price and durability. Models made from aluminum are very affordable, better conductors of heat, but often come at the expense of design and quality. While stainless steel cookers are expensive, they’re often more durable and these days are often accompanied by an aluminum bottom for better absorption of heat. If your budget is rather limited, you’ll do well with an aluminum cooker, but if quality and durability are a priority, having a stainless steel cooker will be a better option in the long run. The features to consider when searching for the best pressure cooker. Safety features are especially vital when dealing with electric pressure cookers. This is due to the fact that pressure cookers work under the principle of built-up pressure and, in a worst-case scenario, an intense amount of steam and pressure could, in theory, cause a destructive blast in the kitchen. You’ll do well to get yourself a device that comes with pressure indicators, secure lid locks, and effective release valves. Regardless of which regulator you use, look for one with 15 maximum pounds per square inch. This is considered standard, and all recipes are designed for this amount of pressure. Anything lower will slow down the cooking time. The weighted valve pressure regulator is also referred to as a jiggle top. It is modestly priced and is used on top of the vent pipe where excess steam escapes. It needs to be removed for cleaning, and always make sure it is not blocked before each use. The pressure is regulated by a rocking movement exhibited by the regulator. When it starts to rock, that means cooking is in progress, and it should rock with a gentle rhythm, letting you know everything is okay. Check immediately if this stops and becomes quiet. Modified Weighted Valve Pressure Regulators are attached to the pressure cooker and release steam in small bursts to reach and maintain 15 pounds of pressure per square inch (PSI). They are modestly priced, though slightly more expensive than the weighted valve. Exercise caution with this device as its not always easy to tell when pressure is being released, and it should also be noted that cooking with lower temperature usually means an easier release of pressure. Spring Valve Pressure Regulators use a pop up one-inch valve to indicate the cooker’s pressure. They are more expensive, and most allow you to choose between 10 or 15 PSI. It doesn’t make noise, so you’ll have to watch it closely to see if pressure is being released or not. The stove top temperature is used to adjust the pressure level, and fewer liquids are sometimes needed with this version. Several manufacturers make pressure cookers. Pick one who’s been in business for many years with a good financial background. This is especially important because, should you ever need to by replacement parts, you’ll want a company that’s still in business, and pressure cooker parts cannot be intermixed between manufacturers. Only buy pressure cookers from reputable retailers as well. Check to see if they sell the replacement parts, which will mean less of a headache if you ever need to acquire some. Choose a pressure cooker that is approved by UL, the Underwriters Laboratories, or another qualified testing organization. This lets you know it meets a set standard of quality and safety. Always buy a pressure cooker with a cover interlock system. It is an essential safety feature that will automatically lock the cover while the pressure inside is high, and unlocks once the pressure is safely lowered. It also won’t allow the pressure to build until the cover is in place properly. This is a sure fix to many of the uncertainties and risks many fear when it comes to using a pressure cooker. Some pressure cookers also have a visual pressure indicator for safety. It lets you know if the pressure inside is high. When cooking with pressure you can never have too many safety features. Look for models offering a secondary pressure relief mechanism that will release the pressure if the vent pipe were to become blocked. Handles, though they may seem like a small consideration, must also be inspected for durability as it’s likely that, at some point, you will need to carry a pot filled with food. Handles need to be secure and comfortable to your grip. Practice holding the pressure cooker before purchasing it to make sure it is a good fit for your hands, and also note that they must be relatively heat resistant as they will be in contact with intense heat while the pressure cooker is in use. Always follow the recipe as to which one to use. To cool a cooker at once, put the pressure cooker in a pan of cold water or under running cold water to quickly release the pressure. 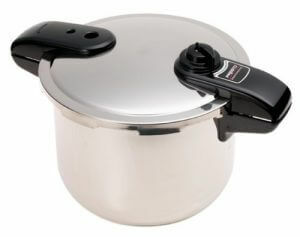 A pressure cooker with a quick pressure release knob can be removed from the heat and then use this feature to release the pressure quickly, noted by a spray of steam being let out. If a recipe calls for natural pressure drop, remove the pressure cooker from the heat source, and allow it to cool down on its own. #7 Cooking Baskets and Racks. Racks and baskets allow you to separate different types of food within the pressure cooker. This often produces optimum results as you can cook separate foods without allowing them to influence each other. The interior and exterior material of the pressure cooker is usually the same. However, some models have non-stick interiors which can sometimes be beneficial in terms of clean up; however, according to many pressure cooker reviews, this feature isn’t very important as non-stick materials don’t hold up well under intense pressure. For easy cleaning, no scorching, and perfect heat conduction, buy a pressure cooker with either a tri-metal or bi-metal base. Bi-metal and tri-metal bases are found in various models, and they usually include a layer of aluminum that minimizes scorching and cooks evenly by allowing the heat to be evenly distributed throughout the pot. Some pressure cookers cannot be used on ceramic cooktops, so it’s best to check for compatibility when looking for a pressure cooker. However, most pressure cookers are compatible with all cooktops. This consideration isn’t necessary if you’re looking for an electric pressure cooker as these models have their own heat source. #11 Recipe and Instructional Booklet. The best pressure cookers will come with a recipe and instruction book. It should give the owner clear directions on how to safely operate the pressure cooker and some basic recipes to get you started. 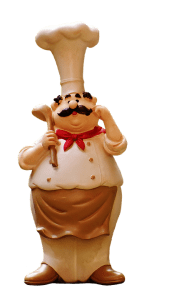 It should ideally be written clearly and simply enough that a new pressure cooker operator and cook will be able to whip those recipes up in no time and with minimal confusion. Prices fluctuate tremendously among pressure cooker models and manufacturers. Extras and upgrades of the basic features often are what run up the cost. However, don’t think a low price is automatically a good deal. The better deal may be a pricier option that will satisfy more of your cooking needs. In addition to this, safety should come first, closely followed by ease of use. #13 What size is best for a pressure cooker? 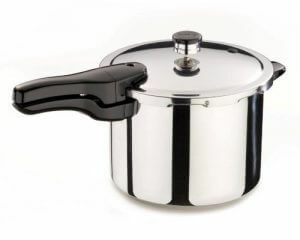 In your search for the best pressure cooker, you will come across a wide range of sizes. Choosing the wrong size can make using your pressure cooker frustrating. On the other hand, should you choose a size optimum for the number of your family and guests, you’ll quickly find yourself using your cooker often. Keep in mind that the capacity listed measures how much liquid it can hold. Only one-half to two-thirds can actually be used when cooking. The additional space is needed for the steam. There are three common sizes. Four Quarts – Ideal for singles, couples, or creating a single side dish. Six Quarts – Most popular in families with more than two people. Most recipes are created for this size. 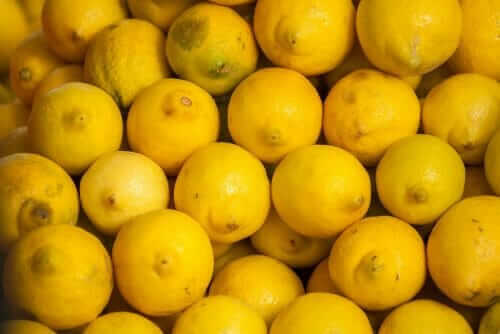 Eight Quarts – Ideal for large families or making a stock. There are also 16, 18, and 23-quart pressure cookers, but these are usually reserved for canning vegetables, meats, and other low-acid foods in quart or pint jars. Why not invest in a healthier meal? 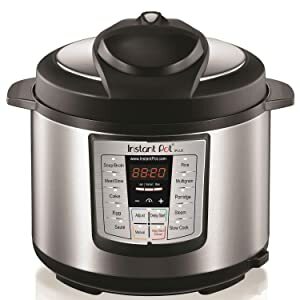 For only about a hundred dollars, the best pressure cooker will give you great tasting meals in a very short period of time. Your family will be amazed by the results, leaving you more proud of your cooking and your life generally less cluttered and pressed for time. Keep in mind that your newly purchased pressure cooker is a long-term investment that can serve you and your family for years to come. It is thus important to take time and find the best pressure cooker for your needs. When considering price, avoid lower quality bargain cookers that may come at the sacrifice of safety or longevity of use. For ease and convenience of cooking, pressure cookers are an essential small appliance in the kitchen. Remember to read the instructions and safety precautions before cooking the first time. Afterwards, it is time to enjoy your new pressure cooker that will give you more time for the important things in life. Hopefully, this guide has helped you decide on the best pressure cooker for you! All You Need To Know About Pressure Cooker Risotto In 7 Minutes! Does an Instant Pot Work Well As A Slow Cooker? Non-Stick Or Stainless Steel Pot For My Electric Pressure Cooker? pressurecookerportal.com is a participant in the Amazon Services LLC Associates Program, an affiliate advertising program designed to provide a means for sites to earn advertising fees by advertising and linking to amazon.com.